Sugar-white beaches and emerald green Gulf waters set the mood at this resort. Shoreline Towers Resort offers the Deep South at its best! Gentle sea breezes provide perfect sailing and windsurfing conditions. Fish from the longest pier on the Gulf Coast. Area Civil War forts and antebellum mansions serve as fascinating reminders of a past era. Enjoy it all from this Gulf Shores resort. Explore the charm and flavor of the Deep South when you visit Gulf Shores. This resort destination is a perfect seaside getaway, with gentle sea breezes that offer spectacular sailing and windsurfing conditions. The Gulf’s white sand beaches are as relaxing as they are beautiful to behold. History buffs will love exploring the nearby Civil War forts and antebellum mansions, while the avid fishermen can get their kicks on the longest fishing pier on the Gulf Coast. Charter fishing boats are also available throughout the area. With its stunning views of the Gulf Coast, and its prime location on the beach, Shoreline Towers Resort is a perfect resort for your Gulf vacation. When you’re not splashing around in the on-site pool, explore the area on bicycles, which are available at the front desk. Visit one of the outstanding local restaurants featuring fresh, well-priced seafood, or have a cookout with one of the BBQ grills available to resort guests. Direct beach front! If you love the walking or swimming at the beach, relaxing by the pool, or just sitting on your balcony with a book and a drink, enjoying views of the gulf, all for a reasonable price, this is the place for you. Each lodging accommodation measures a huge 1450 square feet. Each holiday rental unit has 2 bedrooms, 2 bathrooms, a large full kitchen, washer & dryer, VCR/DVD player, stereo, living room, dining room, and a private balcony with views of the beach, pool, and the seemingly endless Gulf of Mexico. There are outdoor grills on the ground floor. Shoreline Tower’s two bedroom condo vacation rentals sleep up to 6 people, with a king bed in the master bedroom, 2 twin beds in the second bedroom, and a queen sofabed in the living room. 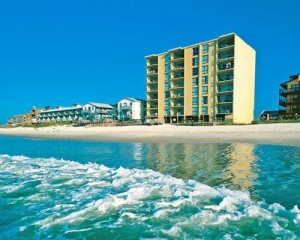 This 8 story resort, built in the early 1980s, has a gorgeous location right on a nice uncrowded white sand beach. This is a family place; the rentals to spring break college kids are down the beach a ways, so this area is quiet and family friendly. There are no fancy crown moldings or jacuzzi jetted tubs, and only a modest pool. The beds are comfortable. There are only a few units on each floor, and the solidly built concrete and steel structure ensures no sound from your neighbors. Shoreline Towers is in a great location, quiet but with easy access to the entertainment areas straight down Beach Boulevard, where you’ll find both the tourist traps and great little restaurants. Leave your sliding door open and fall asleep to the murmur of the waves at night! While Shoreline Towers is one of the older condo resorts in Gulf Shores, the building and furnishings have been well-maintained and the location is excellent. Both the 2 and 3 bedroom units are very roomy with large balconies and great views of the pool and beach. Take the elevator down and it is steps to the beachside pool which includes a nice kiddie pool, too. The beach is just steps from the pool. There is a nice outdoor grill area and the facility is located within a 5 minute drive of all the attractions and restaurants in the area. The staff are friendly and helpful. This resort had many upsides: location, nearby restaurants, large condos, all with a balcony overlooking the gulf. The beaches in this area are beautiful white sugar sand and are typically not overcrowded.